Let me share one of the most popular Indian dish with chicken which is well known around the world. 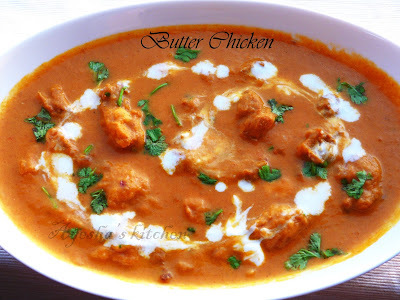 Butter chicken, a mildly spicy creamy rich gravy with chicken . With no doubt, it is absolutely delicious curry based dish which goes well with Indian bread or rotis, ghee rice or parotta. No need of further explanation for this lovely treat. It tastes yummy as it looks . Butter chicken or murgh makhani is an Indian curry based chicken dish. This is rich chicken dish with medium hot taste. Here the chicken is well marinated with the spices and curd, cooked in the onion tomato gravy and finally dressed with cream. 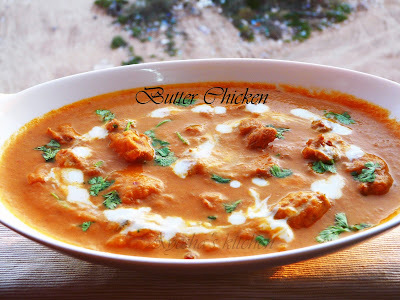 Butter chicken with Indian parotta or nan is worth tasty. Here is a great recipe for the perfect butter chicken. Do try and drop your feedback. Combine the chicken pieces with chili powder, lemon juice, turmeric powder, yogurt, ginger garlic paste, garam masala powder and salt. Set aside for 30 minutes. Then fry the marinated chicken and set aside. Heat oil in a wok and saute onion till soft. When done add ginger garlic paste and again saute for few minutes. To this add chili powder and garam masala powder and cook till oil separates. Remove from flame and let it cool. Once cooled grind together this sauteed mixture along with yogurt and grind to a fine paste. Now heat butter in a pan. Add 1 tsp crushed garlic, 1 tsp chili powder, saute for a while and then add tomato puree. Cook for few minutes and add the ground paste. Add half a cup of water and bring to boil. Once boiled, add fried chicken pieces, kasuri methi and cook till done in a slow flame. Finally add cream and coriander leaves. Mix well. Serve hot with Butter nan, parotta, Chappathi etc..